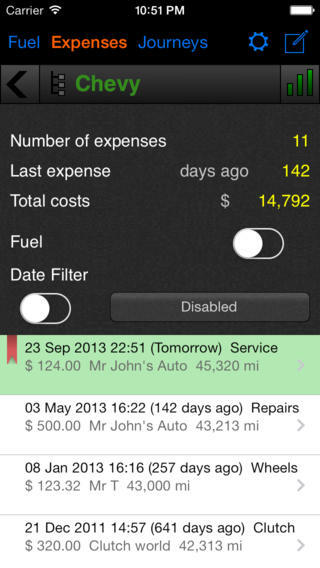 Car Logbook is the perfect App to keep track of your vehicle mileage and fuel consumption. You can even graph this data over time. Additionally, you can save a record of your business trips for tax purposes. Q: I have some requests/suggestions/bugs, what do I do? A: Send me an email and I will get round to adding/fixing it!!! Q: I tried clicking "Upgrade" but it gives me a connection error. What do I do? A: Try force quitting the App (double click home button; click and hold on the Car Logbook icon until it shakes; click the little "X" on the icon.) Make sure you have an internet connection, then try restarting app and click upgrade. Q: How do I change the name of a Car? Q: How do I delete a car? A: Select the car to delete. Click on the car name, and then at the bottom of the next screen click "Delete"
Q: How do I delete a fuel stop? A: Swipe from left to right (or right to left) on the fuel history table and click delete. 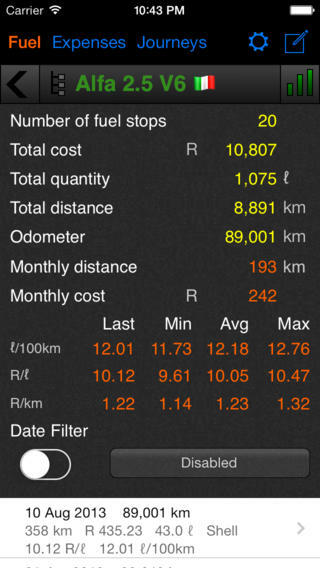 Q: Not all my points show me my fuel consumption, why? A: Most likely this is because you have not filled the tank on those stops AND the stops before it. Car Logbook only calculates the consumption when there is at least two consecutive filled tanks. Q: Why must I fill the tank to get the consumption figures? Q: What is a Journey, and how do I use it? A: The Journey section allows the user to save specific trips to keep record for tax returns or for his company records etc. 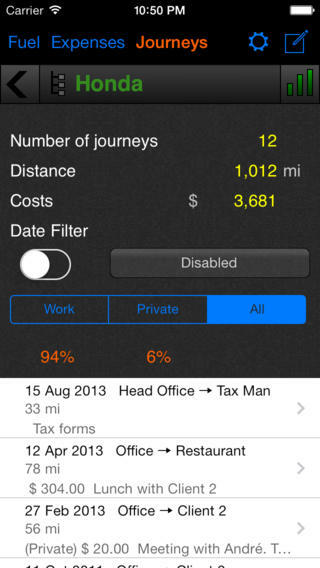 Journeys allow you to specify the details of a specific trip like the distance, the customer, reason for the trip etc.